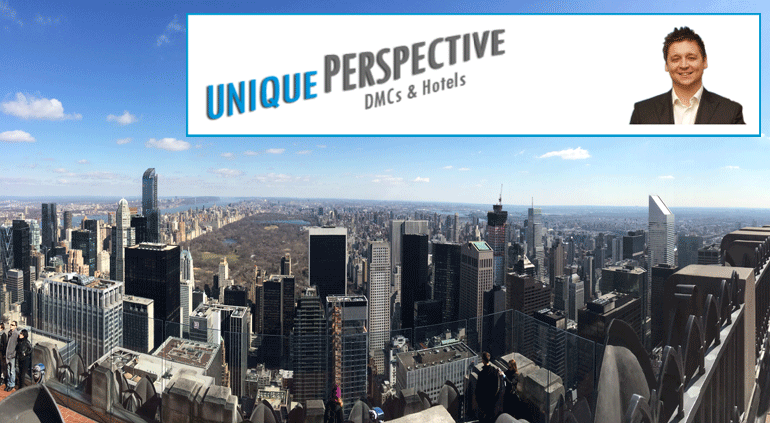 Following my recent visit to New York, welcome to the first edition of my 2014 unique perspective. My colleague Andrew Harvey is really the NYC guru at Uniqueworld, having lived there for seven years. I’m now delighted to introduce some of the meeting and incentive experiences our New York DMC (Briggs) offers. I intend to highlight what is new and innovative but also highlight why the number one long haul European incentive destination offers much more in Brooklyn, Manhattan, The Bronx, Staten Island and Queens. Here is a sneak preview of the real New York. 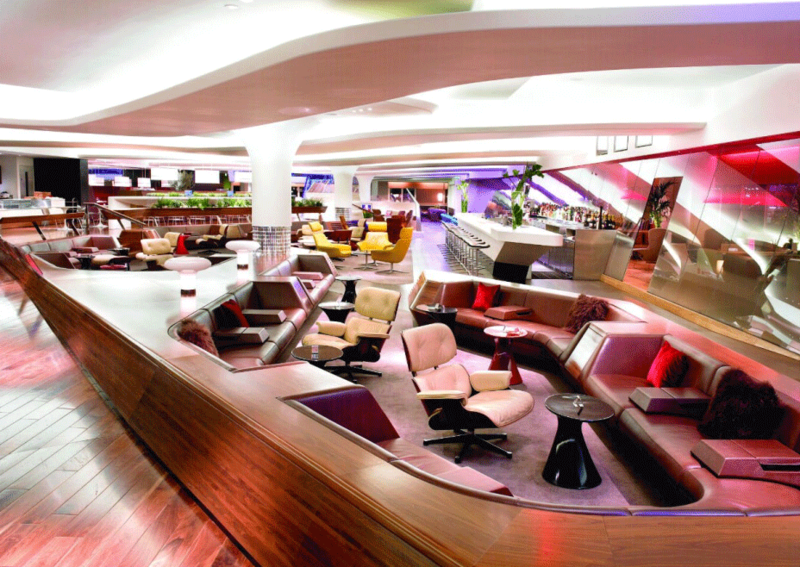 Our New York British invasion started at Heathrow Terminal 3, meeting our group of very excited event planners. We were proud to host some of the UK’s most highly regarded meeting and incentive companies, all unaware they were about to experience the height of bling. Alice, our Virgin Atlantic representative, arranged for everyone to be checked in Upper Class, a very relaxed and smooth check in. It’s worth mentioning that Virgin Atlantic, an airline with over thirty destinations worldwide, recently launched a groundbreaking six week trial of the Google Glass or Sony Smartwatch used by the concierge staff to test the possibilities of providing a even ‘more’ personal service during check in. This embracing of innovative technology advanced my fondness of Virgin Atlantic’s – and believe me, we tested it! The group was then whisked away via the fast track lift, through fast track security to the award-winning clubhouse, where the food was quite exquisite. Some of us indulged in the spa treatments available. I stayed behind and seemingly entertained the remainder of the group with my choice of drink, ordering a Campari and orange juice. It was so nice, I had two. After much joy and happiness at the Upper Class Virgin Atlantic bar and a sneaky burger or two, sadly our enjoyable flight after a 7hr and 11 minute journey made touchdown! We landed in Newark, and our New York DMC ‘Briggs’ was ready and waiting. Escorted by the ‘Magnificent Katilin’, we soon arrived at the Langham Place hotel for cocktail drinks on arrival. Stunned by the dramatic views of the Empire State building, the Vice President Cosimo welcomed us to the Briggs New York experience. One of the key components of making a good DMC is consistency and reliability. 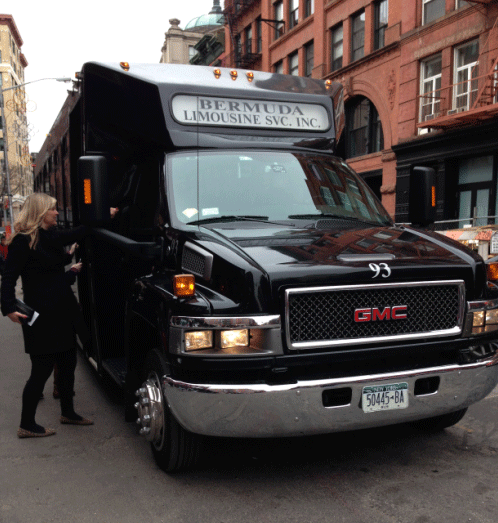 Our New York DMC prides itself on working with transportation organisations locally based, ensuring within a click of the finger, a missing delegate or an urgent transfer being required – the Briggs New York DMC team is there. A DMC will find the right accommodation to meet your precise requirements. 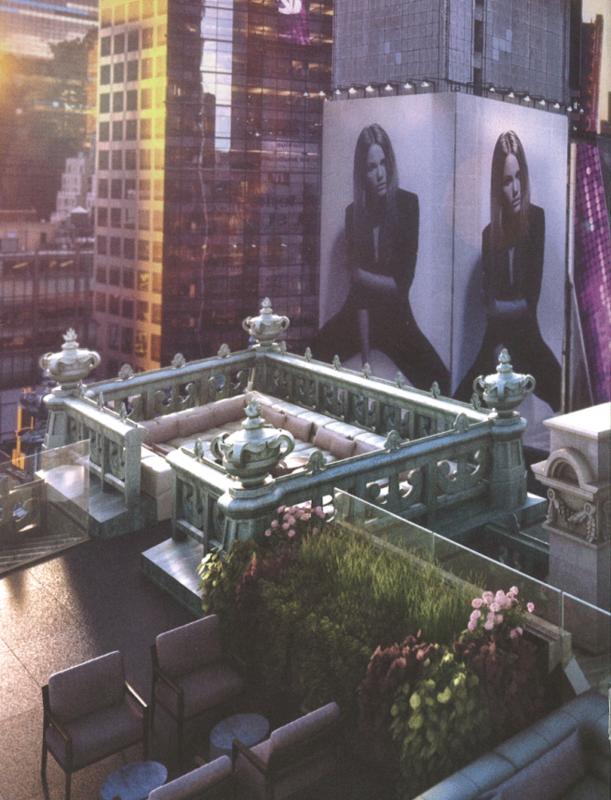 In the morning Simon’s site inspection of the Langham Place, Fifth Avenue, identified the hotel, comprising 157 stylish guest rooms and 57 ultra-luxurious suites, perfectly designed for an incentive group. Impressed with the extremely large bedroom space, our rooms all have the deepest city hotel bath I have ever seen, with walk in showers. The environment provides experiences that stimulate the senses, from scented corridors to rejuvenating treatments, excellence in its Michelin-starred restaurant, Ai Fiori, or enjoy jazz and exceptional cocktails and snacks at Measure lobby lounge to spark the imagination. Our first day in New York was packed full of anticipation. Immediately we demonstrated how our New York DMC office can really show off our connections behind the scenes on Broadway. With Briggs’s long standing relationship with tour guides and extended contacts we were spoilt with a behind the scenes tour of the Amsterdam theatre. Here your group can benefit from a dining experience within the venue, the theatre production and to add to this experience, the Briggs ‘touch’ allows you to meet a celebrity or two behind the scenes. Here, Louise saw the opportunity to become the mature little mermaid, James as a ‘jester and joker’ and Sarah and Matt the Lion King – the next Broadway stars. This is a small taster of what makes us unique; we aim to get you behind the scenes where other visitors cannot. This was followed by going to Top of the Rock, something you simply must do in New York City to make your visit complete with inspiring, unobstructed views from high atop the Rockefeller Centre. Queuing? No, for meeting and incentive groups you can go straight to the top via the VIP route! What’s new? Stay tuned for a panorama restaurant soon to open for large groups within the center, a venue with privileged and exclusive access with our New York DMC. Time for a meeting venue visit, and it goes without saying everyone was impressed with Jazz at Lincoln Center, an entire facility, which holds all aspects of a meeting in one location. Situated on Broadway at 60th Street, the main concert hall lends itself to incredible acoustics for an auditorium day meeting for up to 1,200 persons or a seated gala event with an incredible view of Broadway and Central Park by a 50 by 90 foot window in the Allen Room. Or for an evening dining experience, indulge a culinary and entertainment experience at Dizzy’s Club Coca-Cola, with 140 seats, the intimate jazz club named after the famous jazz artist Dizzy Gillespie. Looking for a white canvas? Our New York DMC then presents a venue which quite literally helps you grow your event! Bouley Botanical located in Tribeca, is a new events space designed to excite all five senses. A venue themed through colour LED lighting, media wall, state-of-the-art sound, video and decoration to fit the mood of your event. Botanical envelopes your guests in an environment of pure ingredients, featuring 400+ edible species of plants growing in vertical window gardens, supported by the largest bio-dynamic green house in New England. 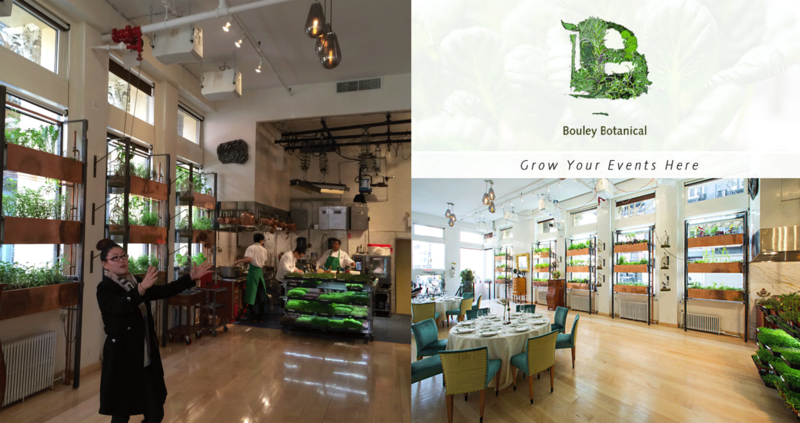 Bouley Botanical comfortably accommodates parties from 8 to 100 people for seated private dining events and up to 150 people for receptions. This food concept then lends itself to continue the mood and include a test kitchen for cooking classes from low budget to high budget with celebrity chefs. The multifunctional Bouley Test Kitchen serves as an elegant event space, an interactive classroom, and a state-of-the-art culinary laboratory. To continue the concept of visiting ‘new’ venues and experiences, we arrived at the much anticipated opening of The Wayfarer 130 seat signature Seafood Grill restaurant in the New Quin Hotel, for a private dining room lunch. Greeted by the restaurant owner we were then introduced to Executive chef Braden Reardon for an Oyster opening and tasting session behind the bar. Whilst I watched the group having fun, I sipped on my large glass of wine hiding from the responsibility of oyster opening with a knife. I could not help notice the Wayfarer’s 1800s-meets-1970s décor oozing style. I then noticed our newly introduced New York DMC host Sarah order a tasting of the spicy Bloody Mary. It quickly became apparent the Wayfarer is ultimately a hotspot haven for great cocktails in the heart of midtown. I’m now addicted to New York! After lunch, we followed with a short inspection of the Quin hotel. Consisting of 208 guests’ rooms and 28 suites this truly represents a small luxury boutique hotel. One of Quin Arts’ most dramatic features is the 15-foot video art wall in the lobby – a perfect wow feature for any international incentive group arriving. The evening excitement continued with our dinning extravaganza at the Knickerbocker hotel’s sister restaurant Aureole (Charlie Palmer’s Restaurant). The hotel we were unable to see, as it’s under construction, although built in 1906 and to be reopened shortly, the hotel is in a prime location in the heart of the City, at the crossroads of uptown and downtown. An urban oasis with a members-only feel, the hotel will feature 330 luxury guest rooms, including 40 suites, a state-of-the-art fitness center, and meeting space for up to 250 guests. Charlie Palmer makes his mark on all the food and beverage venues throughout the hotel, from the lobby-level cafe, the 4th floor signature bar and restaurant, to the crowning jewel, a 7,500-square-foot rooftop bar and lounge – the rooftop being a huge selling point looking right over Times Square. After an amazing dining experience we then adventured to the Mondrian SoHo boutique Hotel located in Manhattan’s vibrant SoHo district with 270 rooms, an indoor-outdoor bar, Isola Trattoria & Crudo Bar restaurant with lush garden seating, and of course Mister H, the discreet nightlife space. For young incentive groups, it’s a hotel ideal for media/technology industries. The perfect property to continue the night to the very late hours and we did just this, a VIP enclosure in real celebrity style with James showing the crowd his Brazilian samba ‘hip’ funky groves. ‘Wow’, being the word experienced more than once, the British invasion just gets better and better. On our next day we ventured out of town to Brooklyn to see dining venues from the other side of the East River, not enough time for Long island, but time for ‘new and innovative’ experiences, with a visit to Gleesons gym, a great venue for incentive travel or even a small experience meeting. We can even wheel out Mike Tyson himself to meet your group for a motivational talk! For those boxing gurus, you may want to know Muhammad Ali, then known as Cassius Clay, also trained at Gleason’s. For an offsite gala venue or meeting there’s the King’s County Distillery, New York City’s oldest operating whiskey distillery, the first since prohibition and founded in 2010. Did we do whisky tasting? Let’s just say James’s hangover, was no more. With our taste buds now tantalized, to continue the ‘behind the scenes’ concept we went back into midtown for unmatched sophistication at The London NYC Hotel. Ushered through the hotel to the bustling kitchen, we were welcomed with canapés and wine to accompany a cooking demonstration and wine tasting session with the Gordon Ramsay team. The London NYC accommodates meeting groups of 10 to 200. The meeting space is designed with the same custom-hewn flair and gorgeous utility as the entire hotel. Not a scrap of vinyl wallpaper or florescent bulb can be found, with handed painted wall art really giving the interior a non-traditional feel. The real wow factor then came when learning this boutique feel property boasts a massive 562 rooms and 54 floors, lending itself to excellent New York DMC group rates! The afternoon allowed us free time, with some of the preferred options being a quick trip to the nail salon for Katy, or a visit to the iconic department stores of Macy’s, Bloomingdale’s or the Bergdorf Goodman store for some Jimmy Choo shoes but James opted for the Nike Store. If time would have allowed one could immerse themselves on ‘the ride’, a theatrical show and performance to see the New York City highlights. The evening commenced with PDT – Please Don’t Tell – a cocktail lounge affixed to Crif Dogs, an East Village hot dog shop. We entered via a telephone kiosk in the hot dog shop to an authentic speakeasy style bar. Here you can spoil a group of 30 persons with cocktails poured by the United States number one cocktail barman and for this excursion we were welcomed by the Briggs New York DMC president Tony who tasted a cocktail or ‘eight’ on his table with Mark, Katy, Carolyn, Louise and James. Meanwhile, the other table of Lynsey, Sarah, Alice and the guys were busy making their requirements for the ultimate cocktail. After a few cocktails and comical innuendos the evening got off to a good start. Dinner allowed us to visit the Hyatt Union Square, with 178 rooms a relatively new hotel and again another good alternative incentive hotel option. Botequim, a South American restaurant with a heavy focus on Brazilian food, wowed the group located on the lower level (just below The Fourth). Still in midtown we hit the fashion district and continued to the Refinery Rooftop, the crown jewel of the Refinery Hotel, a turn-of-the-century hat factory turned luxury hotel. With an inbuilt kitchen, cool DJ vibes, the 3,500 square feet year-round rooftop lounge lends itself perfectly for the cocktail evening event of up to 240 persons for breathtaking Empire State views and a wow event. Our last night in New York City finished at New York’s largest outdoor Rooftop Garden at 230 Fifth for a fully enclosed Penthouse Lounge, again spoiling us with the breathtaking views of the New York City skyline. The venue can accommodate private functions 25 to 1,200 guests in 24,000 square foot space. It boasts two floors, one fully enclosed Penthouse Lounge and private event rooms, as well as an outdoor rooftop. The Rooftop Garden is extremely large with oversize umbrellas for rainy days, or for hot sunny days. Breakfast was onboard the Hornblower Infinity, a recently remodelled vessel with three levels offering distinct entertaining areas, state-of-the-art light (based on the Virgin Atlantic Airline’s lighting) and sound equipment and 5-star cuisine. For private events you can consider this option with 700-1,000 guests. However, to continue the running theme of ‘new and innovative’ why not reduce your carbon footprint with the Hornblower Hybrid, the newest—and greenest—yacht on New York harbour! Fueled entirely by hydrogen fuel cells, solar panels and wind turbines, the Hybrid boasts cutting-edge, green technology and is the most innovative and eco-friendly vessel on the water. This yacht allows 350-600 guests. From the River we then visited the 9/11 Memorial. The museum is set to open May 21st 2014 after a five-day dedication period for victims’ families. It was an educational and historical day honouring the victims and a time to think of re-birth. 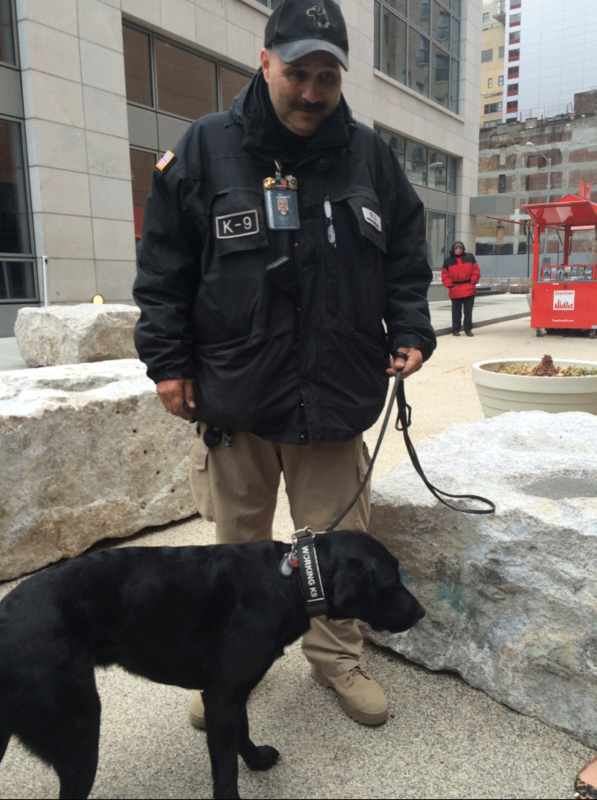 Organised by our New York DMC, we had the opportunity to listen to a NYPD police survivor, and meet with an officer and his sniffer dog, a cute black labrador. It truly will remain with me as a memory forever. No matter what your budget, your group can have a taste of New York. From Michelin star, cafes, delis to street food our New York DMC caters for all. Explore New York’ s urban indoor food market, the birthplace of the Oreo Cookie at Chelsea Market, the ultimate indoor food paradise. Stop off at the oldest ever established delicatessen restaurant in the old Jewish quarter, Katz’s Deli in Lower East Side, which coined the phrase “send a salami to your boy in the army.” But most will remember this deli from the famous movie scene of ‘When Harry met Sally,’ quite possibly the best orgasmic sandwich I have eaten. Seemingly Matt, Carolyn and Alice really enjoyed theirs also. Our journey finished at Di Palo’s of Little Italy, a traditional Italian grocery store for some cheese and wine tasting, choosing some delicious home made goat, sheep, and cow cheeses, mozzarella and prosciutto. This location actually coincides with a culture tour, it being the location of where the Godfather was assassinated and yards from the FBI phone tapping of John Cotti’s headquarters. Costantino Paul “Big Paul” Castellano, succeeded Carlo Gambino as head of the Gambino crime family as the Godfather, then the nation’s largest Cosa Nostra family (June 26, 1915 – December 16, 1985). The unsanctioned assassination of Castellano by John Gotti sparked years of animosity between the Gambinos and the other New York crime families. This history of events can be cleverly coincided with the suspense and thrill of The Godfather movie tour locations including to the Bronx. New York is quite like Italy in some ways, as there is always something new opening. Having a DMC with intimate knowledge of the city allows you to save time and money, but also improving the event concept design by selecting the right venue for your group. There is so much more to talk of such as the more traditional and contemporary offsite venues. For private dining options as an example, check out the Lotos Club, one of the oldest literary clubs in the United States, great for boardroom meetings and gala events. At Uniqueworld we’re proud to have New York DMC ‘Briggs’ to deliver quality and consistency of services to host and produce the perfect impact for your events. Thanks to Briggs New York DMC office for being their usual self of uniqueness and providing an ‘educational event with a twist.’ It goes without saying the Langham Place was a truly classical and classy accommodation option. We had a late check-out and even on this day the room was made up! But last but not least, thanks to Virgin Atlantic for embracing the human spirit and providing our group with impeccable service.